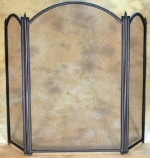 The 3 fold Regal fire place guard (Black) is available in 2 sizes. Folds in three when not in use. A good looking and effective spark barrier and blends in nicely.